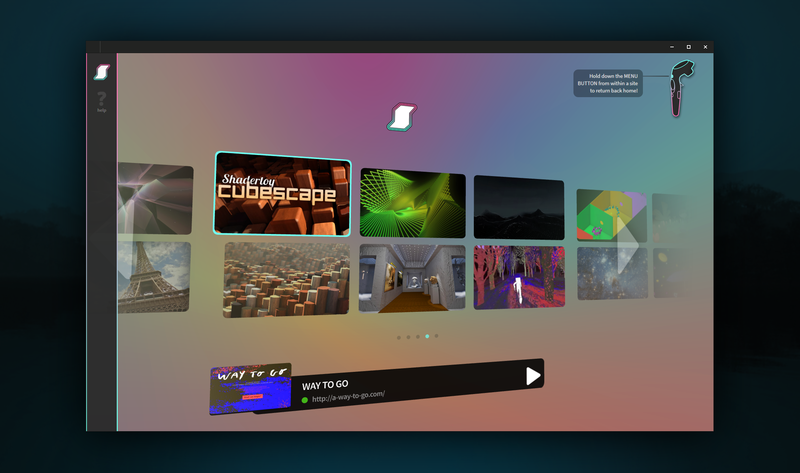 Find more examples on the homepage, A Week of A-Frame, and WebVR Directory. :eyeglasses: Virtual Reality Made Simple: A-Frame handles the 3D and WebVR boilerplate required to get running across platforms including mobile, desktop, Vive, and Rift just by dropping in <a-scene>. :heart: Declarative HTML: HTML is easy to read and copy-and-paste. Since A-Frame can be used from HTML, A-Frame is accessible to everyone: web developers, VR enthusiasts, educators, artists, makers, kids. :zap: Performance: A-Frame is a thin framework on top of three.js. Although A-Frame uses the DOM, A-Frame does not touch the browser layout engine. Performance is a top priority, being battle-tested on highly interactive WebVR experiences. :globe_with_meridians: Cross-Platform: Build VR applications for Vive, Rift, Daydream, GearVR, and Cardboard. Don't have a headset or controllers? No problem! A-Frame still works on standard desktop and smartphones. :mag: Visual Inspector: A-Frame provides a built-in visual 3D inspector with a workflow similar to a browser's developer tools and interface similar to Unity. Open up any A-Frame scene and hit <ctrl> + <alt> + i.
:runner: Features: Hit the ground running with A-Frame's built-in components such as geometries, materials, lights, animations, models, raycasters, shadows, positional audio, tracked controllers. Get even further with community components such as particle systems, physics, multiuser, oceans, mountains, speech recognition, or teleportation! To check out the stable and master builds, see the dist/ folder. require('aframe')  // e.g., with Browserify or Webpack. git clone https://github.com/aframevr/aframe.git  # Clone the repository. cd aframe && npm install  # Install dependencies. npm start  # Start the local development server. And open in your browser http://localhost:9000. For questions and support, ask on StackOverflow. To hang out with the community, join the A-Frame Slack. Follow A Week of A-Frame on the A-Frame blog. And get in touch with the maintainers!